GAAAAH!!! It can't be helped now, I'm on the hype train to crazy-ville and I'm dragging your butts with me. You're going to see the number of Fallout related stuff on ODeck increase about 100 fold. And to start, we're going to take a look at the project that would have been Fallout 3 had Black Isle Studios not gone bell-up; Van Buren. Van Buren would have taken place in 2253 in the southwestern US, around Arizona, Nevada, Colorado, and Utah. The western-most part of the map would have been the border of The New California Republic, which had grown into a dominate power in the wasteland since Fallout 2. While the exact size of the map is unknown, given that the list of locations available in game included areas as far west as Hoover Dam and as far east as Denver, CO ( a distance of about 680 miles) I think it's a safe bet to say it would have been massive. The Prisoner is, of course, your character. Since your character is a Prisoner, you would have been given the choice of saying you were either falsely imprisoned, or you could choose to be a criminal and gain bonus traits. Since it's so easy to have good Karma in Fallout games, I don't know why anyone would have chosen not to do this (except maybe duri0ng a role-playing run). You started out the game in Cell 13, wearing a jumpsuit with your cell number on it (eh? eh? Get it?) in Tibbets Prison in Arizona. Except you have no idea how you got there from the last prison you were in. After an explosion goes off, you find a hole leading outside. Leaving the prison, the Prisoner is attacked by security robots and flees. Throughout the game, your character is relentlessly pursued by the security robots, attempting to return him to the prison. The main goals of the game included the Prisoner discovering why he/she awoke in a different prison, what happened at/who attacked the prison allowing you to escape, what the NCR is doing so far outside their territory, and a few more things only hinted at in the unfinished code of the game. A sort-of replacement for the Enclave, Victor Presper was an NCR scientist who wished to eradicate Ghouls and Super Mutants and those humans he deemed "impure". He found a way to accomplish this through Limit-115, a secret biological weapon developed during the Great War. Basically the bubonic plague on steroids and redbull, with the added benefit that anyone infected but not killed by it ended up sterile It was planned for use against the Chinese (a major breach of the Geneva Convention, but lets not forget that the US government in the Fallout universe is all kinds of insane). The accidental release of this weapon on US soil in 2052, along with the deaths of 200,000 US citizens was what prompted the research into the Forced Evolutionary Virus (FEV) as a possible cure (and we all know how that ended up). His plan was thus: using Limit-115, Presper would infect a group of people large enough for Tibbets Prison's Supercomputer, ODYSSEUS, to detect and transfer to the Prison (which was still functioning as a quarantine zone) (this is why the Prisoner woke up in a different prison). Once the Prison was full, Presper and his followers would attack the prison, leading the prisoners (infected with limit-115) to escape, unknowingly infecting people they came into contact with . ODYSSEUS would then, according to its pre-war programming, attempt to recapture the escapees and after doing so, assess the viral spread. If the virus spread too far, ODYSSEUS would then arm B.O.M.B -001 (a pre-war space station equipped with 24 nuclear missles) and attempt to "contain the infection" by nuking the entire area. Presper, meanwhile, planned to be on B.O.M.B -001 (yes, in space) and reprogram it to clean only the areas he wants. I assume ODYSSEUS' input is necessary to arm the nukes, or something. That part is sketchy. Meanwhile his followers would wait out the second nuclear holocaust in a secured bunker in Boulder called the Boulder Dome. Something that was supposed to be a big part of the story was a war between the NCR and the Brotherhood of Steel. The Prisoner would be able to visit various settlements and areas controlled by the two factions and his/her actions would have a profound impact on the war and ultimately who won. Through this war, the player would come to understand Prespers plans. What exactly the NCR and BoS are fighting over isn't clear, although given their history, I wouldn't be surprised if it was just because of someone insulting someone else's mother. You can choose whether to go up to B.O.M.B-001 and stop Presper, or put yourself to sleep in Boulder Dome to wait out the new apocolypse. Of course, why wouldn't you end up on B.O.M.B-001 with Presper and his group and attempt to stop them (or take control of it for yourself)? Otherwise it would just be boring. You navigate through the station and reach the command center. From here, it's not clear, as only one possible (main) ending has been confirmed in the files, although one would assume there would be multiple ones in the full game. The only one confirmed is the Space Station being destroyed and part of the world being nuked as the Prisoner escapes in the escape pod. There are, of course, endings for all the areas you visited during your travels, their fate determined by what you did there. Most areas have a "Nuked" ending, implying the Prisoner was going to be able to decide to nuke certain areas. Unlike previous numbered entries, players would be given a choice as to turn based combat (like previous entries) or a real-time combat system similar to Fallout Tactics (I would not have chosen this. It took me forever to get used to tactics' system. Josh Sawyer (lead designer) stated the emphasis would be on turn based combat, since real-time was only included due to being Interplay's demands. Co-Op was to be included due to publisher demands. How this would be implemented is unknown. Van Buren was to feature a heavily modified version of the SPECIAL system, controversial to most fans (although what isn't? Fallout fans (especially older ones) can be whiny little bastards about anything.) This included merging a number of skills and recalculating the way skills (and SPECIAL points themselves) influenced things like Action Points, Armor Class, Resistances, Carry Weight, etc. Skills were divided into 4 categories, each with 3 or 4 skills in each for a total of 13 skills. They also planned to include a variety of Perks that, instead of just jacking up a certain stats, would affect the way you played, much like how Perks work in Fallout 3 and New Vegas. Like how Fallout 2 introduced the AMAZING idea of Intelligent Deathclaws (and then subsequently dismissed as "They're gone, extinct, we'll never see them again") Van Buren was planning to introduce the concept of Born Ghouls; people who are ghouls from birth, instead of transformed that way due to radiation. These Ghouls were the results of experimentation on humans in a location called the Reservation, a visitable location in Van Buren. To the untrained eye, they are no different from any other Ghoul. Looking closer, the lesions, exposed bone, and hair patches are much more uniform then other other ghouls. They are also stronger and faster then normal ghouls. They also could not turn feral, this being seen as a way to phase out the old generations of ghouls who always had the potential to turn Feral, improving Ghoul-Human relations, albeit very, agonizingly slowly. Like Goris, a companion named Measles, one of the only 3 born ghouls, was available who would join the Prisoner and help fill out the story of Born Ghouls and the Reservation. And those are the basics. There is actually quite a lot of information on many of the locations and characters that would have been included (and many of them very interesting), but honestly if I were to type it all out or even just copy it all from their sources I would be here all day long. If you're interested in more and have an hour or two , head over to the Fallout Wikia and just start digging. To me, it is a big disappointment that this game was never released. Not because I hate what Bethesda has done with the series since they acquired it in 2003 (beyond the fact that it took them 5 years to do anything with it), but because the game was SO FREAKING CLOSE to being finished and looked like it was going to be insane and fun. The engine was, for all intents and purposes, finished, and 75% of the audio and half the maps were already completed. The models were finished and they even had a tech demo available. Here's the link to download the Tech Demo on No Mutants Allowed if you're interested. 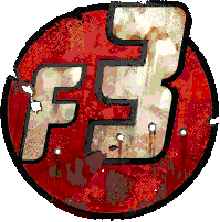 Be forewarned, the site is filled with rabid fanboys of the past Fallout games. They are insane and will attack you if you like anything about Fallout 3 & New Vegas. Just go in, download the demo and get out. If Van Buren had been able to be completed and released, would the Fallout series as it was with Black Isle have survived? Probably not, in my opinion. But I still would have had a ball playing it. At least with Bethesda we still get quality games set in this fantastic universe. Even if they do take enjoyment at watching us squirm with stuff like Survivor 2299.